To help me understand this comic, which is culled from Fake's online mini-comic of the same name, I read at GR reviewer Kim's suggestion "Bodies, Transfigurations, and Bloodlust in Edie Fake’s Graphic Novel Gaylord Phoenix" and that helped me get some angles on the work, which would seem to be a reflection on/exploration of transgender experience. It's largely a series of events, or tableaux, not a narrative, that is idiosyncratic, tacking back and forth between science and magic, phantasmagoria and lust. Psychedelic, surrealism, fantasy. Not boring. Often pretty funny. transplanted with paranthetical notes from my old review of the single issues:I'm not really sure if such an open-ended designation as "series" for a pile of mini-comics really makes sense on goodreads (oh wait, it's gone anyway), but these are strange, and beautifully designed, and awesome enough that I'm going to rate them here anyway. The fifth volume has just arrived, and it's a particularly gorgeous example of extending simple two-color printing via various inventive patterning and dot gradients, all to illustrate the furthest bizarro stages of Gaylord Phoenix's continuing search for identity in an always lavish, sometimes incomprehensible, and often vaguely threatening universe of geometry and squiggles. Volumes 1 through 4 (no wait, it's all 6!) will soon be (have now been) collected in a single volume by the excellent people over at Secret Acres (who also printed Theo Ellsworth's Capacity, Eamon Espey's Wormdye, Ken Dahl's Monsters, all worth a look). But then you'd miss out on Edie Fake's neat silk-screened covers and some of the intricacies of the fantastic color photocopying (I just got the single-issue of 6 and it's gorgeous in ways the book really cannot be; see below). Either way though, really good. 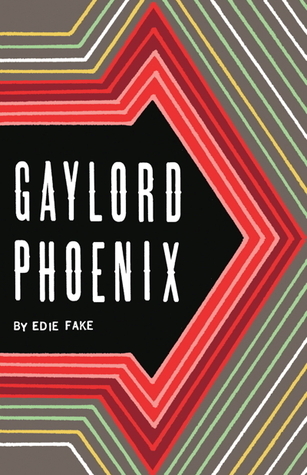 Originally serialized in zine form, Fake's complete Gaylord Phoenix is one of those books that, as you read, you begin to realize the amazing feat that's unfolding before your eyes: You can sense the growing perfection of the thing. As the story develops, and the end approaches, you're practically cheering him on: "You can do it!" You want so bad for all the threads to come together, for all the promise of the earlier pages to be fulfilled... And you turn the page. And it succeeds. This is one of the most emotionally satisfying comics I've ever read. It works. First of all I love the book packaging and the paper weight. It just feels so good in your hand and looks good on the shelf. The art has a simple slightly primitive style with a lot of Jim Woodring peeking through, but it's not unsophisticated just economical and whimsical in it's doodling. There are some pages where the decorative swirls and motifs rise up and try to take over and those pages were a treat. There is a lot going on with Fake's own invented symbolism that I may not have taken in, but it's obvious that he has worked it all out. The text is very sporadic and there are many long flowing scenes with no words at all and that is ok. The story telling is not linear and you just need to sit back and ride the wave. yes, it's experimental, but it thankfully has none of the art school cliches you would expect. This is a personal story, and I sincerely believe that it was written for Fake's own self discovery, not for us. The age of the self confessional comic is over and new voices are seeking out private made public internal dialogues that want to answer only the questions that cannot be answered. Maybe I am bringing that, but he certainly has a great murky genius mind and I'm sure he will shine brightly as part of a new young wave of cartoonists. I'm not always a big fan of surreal, phantasmagorical comics, but this queer-themed graphic novel by Edie Fake did the trick. Fake's artwork reminds me of Theo Ellsworth's, only even more abstract and nonlinear (I was also reminded of Jesse Moynihan's work more than once). In the end, Fake's visuals are arrestingly original and bizarrely beautiful, and the narrative (such as it is) still managed to engage my heart as well as my senses. So lovely to see yet another dimension in the ever-burgeoning realm of queer/gay cartooning. If you are a big ol' dirty queer and you can get your hot little hands on this collection PLEASE DO IT AND DO IT QUICKLY. This series is the bomb[dot]com. I tried to list this as currently reading because I never ever feel like I'm finished with it. I had three of the series (out of sync) and I seriously have gone back to those issues time and time again like it's a drug. I attempted to use some of the content from Gaylord Phoenix in a graduate level course on cultural studies (with permission of course) to talk about gender and sexuality because there is so much throughout this series. There is something mythical/magical about this series, and yet something that whispers across my brain that is so much about human experience and the operations/machinations of culture. picked this up at the NY Art Book Fair from the author this weekend (signed!). When this was in zine format, I found issue #2 at Unnameable Books; it's the most beautiful amazing surreal gay monster comic I've ever seen. so glad I managed to acquire it and looking forward to the time to read the whole thing...I have read the whole thing! I still really like it but it seems somewhat poorly printed - many of the drawings fell into the middle of the book, and the binding doesn't seem to allow me to see the full spread (I'm reluctant to crack the spine). it's still beautiful amazing told almost completely without words, but the zine format is superior. I have a lovely, brilliant student who lent me this very cool book that was basically incomprehensible to me. Then I have a lovely, generous friend, who sourced the academic article I read to help me understand it more (which I learned about from someone else's goodreads review). Basically, it took a village for me to read this book and I'm not at all confident that I understood it but I did enjoy it. It's hard to describe Gaylord Phoenix, to be honest, and it's a book that I think gets appreciated more with time. But even now, it's a book that can only be experienced, and I appreciate Edie Fake's larger than life extravaganza. A beautiful book, sunbursts of weirdness one after the next, like C.F. & Yuichi Yokoyama. Although the single issues are nice to have, the collected edition allows you to get drenched in Edie Fake's incredible world. This book is pretty important. Also, I own it, and I am hapy to lend it to you if you'd like. It was very odd in so many ways. But the art was amazing. Edie Fake - Edie Fake is notoriously morally bankrupt and has an insatiable appetite for destruction. He lives in Chicago where he is currently working at Quimbys bookstore. In the Spring of 2006, Edie performed in the PeaceCore Book Tour across the whole country with collaborator Dewayne Slightweight. In 2007 he and Dewayne unveiled a new work called “Rainbow Dawn” at Art In General in New York. He draws the food fetish zine Foie Gras, the comic Rico McTaco and the recently completed zine Unisex. Gaylord Phoenix, a collection of his mini-comics was released by Secret Acres in 2010. His spirit animal is possibly a “rainbow colored weasel” and he is a Virgo-loving virgo. Both errorless heiress and myopic neurotic, he potentially has an FBI file and unreliable psychic ESPs.